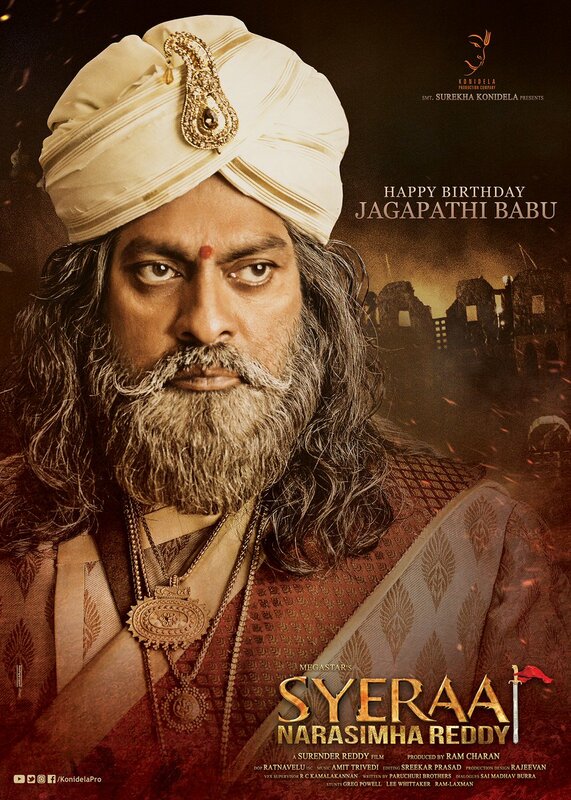 Jagapathi Babu's Stunning Look From Syeraa | Syeraa Movie News Jagapathi Babu's Stunning Look From Syeraa: Jagapathi Babu's look from the movie Syeraa is out on the eve of his birthday. Jagapathi Babu's Stunning Look From Syeraa:- Megastar Chiranjeevi is busy with the shoot of his next film titled Syeraa which is a periodic drama set during the pre-independence era. The shoot of the film is expected to be wrapped up by the end of April and the film hits the screens during Dasara this year. Surendar Reddy is the director and Nayanthara is the heroine. Veteran actor Jagapathi Babu will be seen in a crucial role in this action drama which is named as the life story of Uyyalavada Narasimha Reddy. Jagapathi Babu's first look from the movie has been out today on the eve of his birthday. The actor looks stunning and powerful in the released look. Jagapathi Babu has an interesting role and his assignment has been kept under wraps. Amit Trivedi is the music composer and Rathnavelu is the cinematographer. Bankrolled by Konidela Production Company, Syeraa will release during Dasara this year.